Are you ready for the holidays? Even if you aren't I'm delighted that you have chosen to take time from your busy schedule to read this newsletter. First I want to congratulate Karen Brandt. 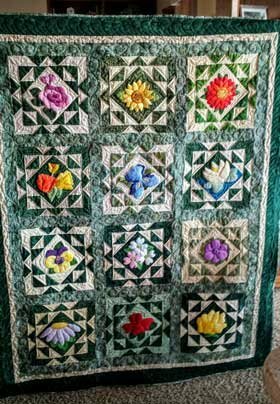 You will recall that Karen used my "Christmas Memories" pattern to make a gorgeous quilt that has been voted into the Arizona Hall of Fame. This same quilt has now been juried into Road to California. Good Luck, Karen. 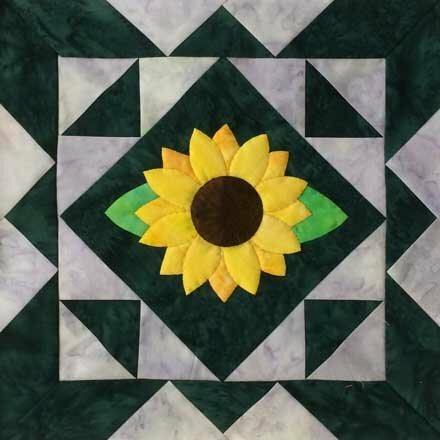 Click here for more inspiration about this quilt. Celine Chabot's "Jennifer's Hillside" Variation Gorgeous!!! Gorgeous!!! Gorgeous!!! 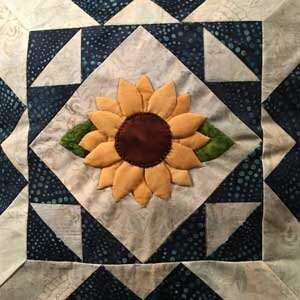 It is so exciting for me as a designer to see a quilter take my pattern, tweak it, and produce something as lovely as this. Celine Chabot of Laval, QB, Canada has done just that. She selected 20 blocks from "Jennifer's Hillside". She set them together with a very simple, yet very striking and effective sashing and solid cornerstones. She added a dark green border separated from a white border with a dark green bias strip. 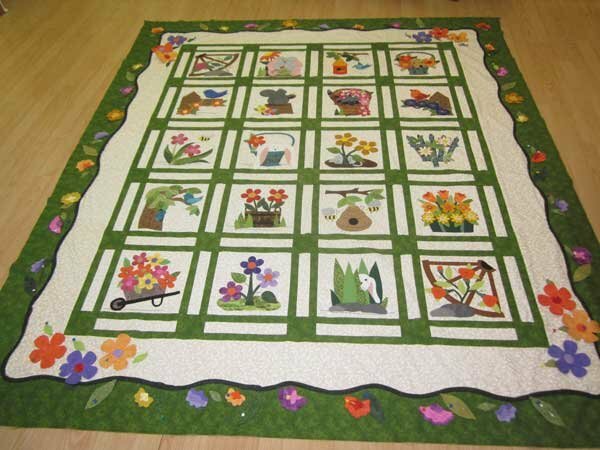 Then she selected flowers from the blocks to add to both the white border and the green border. Wow! It makes me want to make another one using her variations. Great job, Celine. My next free BOM will be starting in January. I'm so excited. You voted and selected a row-by-row, elegant, Christmas wall hanging. It has been a wonderful challenge for me. I'm loving every minute of it. Your first row is at the top of the newsletter. You will receive the pattern for this row in January. It has a 3-D flower as seen to the left. I call it a gathered petal flower. I am making a video that I will post on YouTube in January that will show you how to make this flower. It is really quite simple. 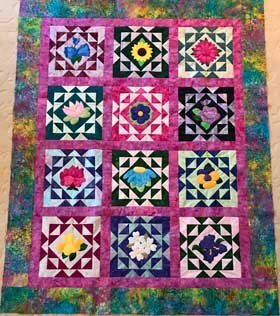 I have been thinking about creating a Facebook page where we can discuss the making of this quilt. We can all post additional tips and photos. Would you like me to create a Facebook page for this purpose? Click on the link and type "YES" or "NO" in the subject line. Click here to vote. Last month I failed to include a link to the following YouTube video that I made. 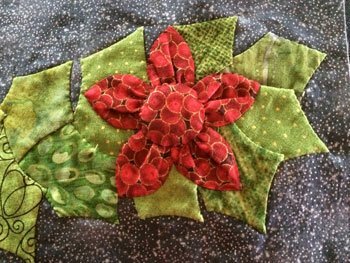 Do you know the secret to beautiful needle-turn applique? Click here to view the video. Here are our completed quilts. I'm afraid mine is only a quilt top at this point. 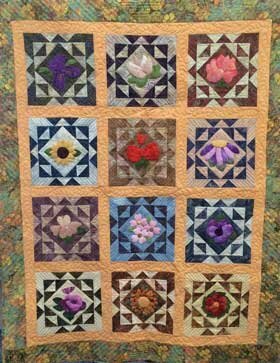 The other two are beautifully quilted. It has been a fun year. I have loved experimenting with sculpting the different flowers. I used a different batt in each block. I am firmly committed to using wool batting for my sculptured applique in the future. I love it's look and feel. 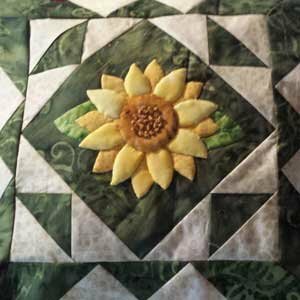 2016 Free BOM - Karen's Gingerbread Florals - Last Block - "Sunflower"
Right: Georgie McKenzie's Sunflower Block. Click here to download a PDF file of this month's newsletter.